Persuasion: A New Musical had its world-premiere production at Taproot Theatre Company from July 12 to Aug. 26, 2017. A runaway success, it became the highest-grossing show in the 40-plus-year history of Taproot Theatre Company. Persuasion will have its California premiere at Lamb's Players Theatre in Coronado from Oct. 5 to Nov. 18, 2018. PERSUASION is one of Jane Austen’s best-loved, and least-known, novels. Eight years ago, Anne Elliot was persuaded to break off an engagement to a penniless naval officer who had only himself to recommend him. When Captain Wentworth returns from war a rich and eligible bachelor, he still can’t forgive Anne for disappointing and deserting him and is determined to marry anyone but Anne. PERSUASION is an autumnal tale of love, regret, and second chances. Austen’s final published novel, it has been called her finest literary achievement and a love letter to herself, her sister Cassandra, and every woman waiting on a second spring. 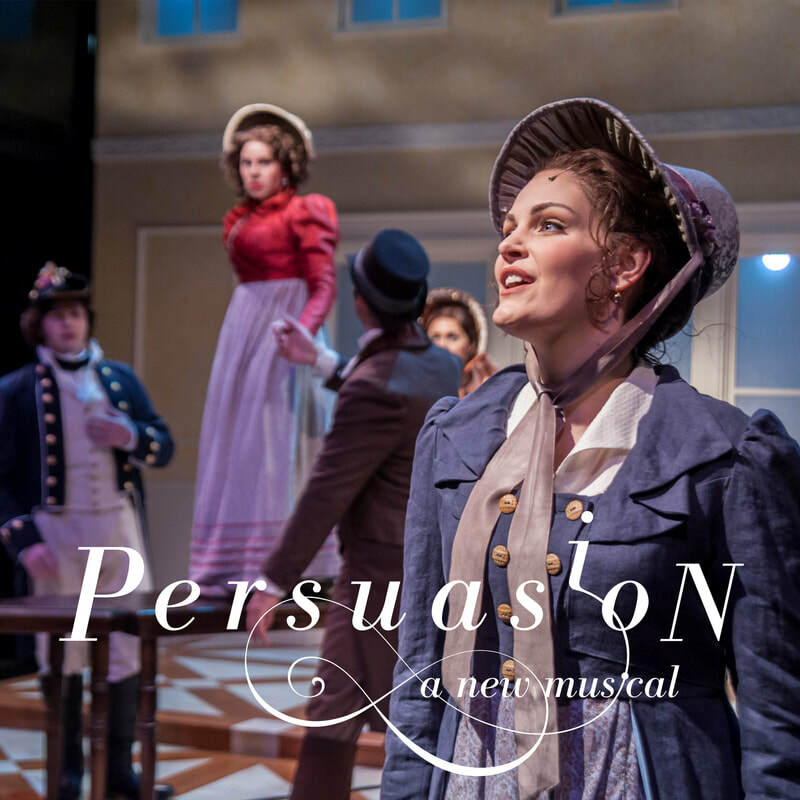 In 2015, PERSUASION: A New Musical (book by Harold Taw; music & lyrics by Chris Jeffries) was presented as a staged reading in The 5th Avenue Theatre's inaugural NextFest Festival of New Work. In 2016, it was presented as a workshop reading at Texas Musical Theatre Workshop. PERSUASION had its world premiere at Taproot Theatre Company in summer 2017 and became the highest-grossing show in Taproot Theatre's 41-year history. CHRIS JEFFRIES (music & lyrics for PERSUASION) has written book, music and lyrics for Vera Wilde and Moon of My Delight (Empty Space Theatre);Kaleidoscope Eyes (Northwest Film Forum); and The Glory Booty Club (Garland Award); I See London, I See France; Radio Pirates; and The Fatty Arbuckle Spook House Revue (Annex Theatre, Footlight Award). Fatty was later produced at Yale School of Drama. Vera Wilde has been produced throughout the U.S. and abroad, most recently in Berkeley (four SFBATCC awards). Music/lyrics credits include Laura Comstock’s Bag-Punching Dog (Los Angeles, Ovation and LA Weekly Awards, Best Musical) and Horse Opera (Seattle, Minneapolis, Washington; NEA Consortium Grant). His music for Bunnicula (Kennedy Center/Seattle Children’s Theatre) has been heard in dozens of productions in the U.S. and Canada. He is under commission by A Contemporary Theatre (ACT) for a musical based on Jack Kerouac’s Maggie Cassidy. Chris received The Stranger’s first “Genius” Award in Theatre and was twice a finalist for CalArts’ Alpert Award in the Arts. A graduate of Yale University, he lives in Seattle, Washington. HAROLD TAW (book for PERSUASION) is a novelist, playwright, and screenwriter. His debut novel was Adventures of the Karaoke King (Lake Union Publishing 2011). His writing has been featured on NPR, in a New York Times bestselling anthology, and in The Seattle Times; his screenplay DOG PARK has garnered recognition in domestic and international film festivals and competitions. Harold wrote the book for two musicals presented as staged readings by The 5th Avenue Theatre: the full-length PERSUASION (2015), which was also presented at the 2016 Texas Musical Theatre Workshop; and the original one-act THE MISSED CONNECTIONS CLUB (2014), which won Third Place in the 2015 Frostburg State University One-Act Competition, was a finalist in the Arts Club of Washington’s 2014 One-Act Play Competition, and was longlisted for the 2015 British Theatre Challenge. Harold is currently completing a novel about a turbulent adolescence in Southeast Asia, collaborating on a Steampunk musical about parallel universes, and co-curating WordsWest Literary Series. A Yale Law School graduate and a Fulbright Scholar, Harold’s research and writing have been supported by, among others, 826 Seattle (now the Bureau of Fearless Ideas), Artist Trust, Centrum, the Helen Riaboff Whiteley Center, Humanities Washington, Jack Straw Productions, and Wing Luke Museum.